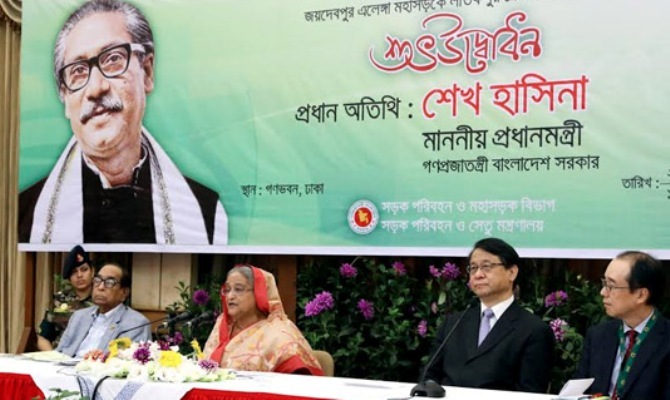 Prime Minister Sheikh Hasina said on Saturday her government is building overpasses at the places of four-way intersections to ease communications by mitigating traffic congestions. “From now on, we will be building overpasses at the places of four-way intersections for making communications smooth and easier alongside stopping traffic gridlocks,” she said while inaugurating three development schemes. The premier inaugurated the four-lane ‘Second Kanchpur Bridge’ on the river Shitalakkhya, four-lane flyover at Bhulta and a railway overpass at Latifpur on Dhaka-Sylhet Highway through a video conference from her official residence Ganobhaban in the capital.